Today’s Sunday Matinee is for a film that both new and old readers are sure to appreciate. It is easily one of the finest genre pieces of the last twenty years, especially if that genre you adore is classic biker films. This is just about as god damned good as it gets. The film’s director, writer, producer, and lead star is known other than genre legend Larry Bishop, who we were fortunate enough to get some words from last July. The film also features one of favorite interviewees (can’t believe it has almost been 4 years!) of all time, the wonderful actress, Laura Cayoutte, who was also an associate producer on the film and is somebody I have personally dubbed as the Queen of NOLA. And as you may expect if you are recognized an uncommon theme here at the Sunday Matinee series, we will soon be featuring yet ANOTHER wonderful member of the Hell Ride team. Only not this week, but in coming weeks. SPOILER ALERT: She is an amazing actress from the film, and she is pictured below next to a smiling Michael Madsen. And we are so excited to share it with you! With that, your homework is the watch Hell Ride, if you have failed miserably to do so already. Which is absolutely unacceptable. Hell Ride also features legendary performances from two brilliant actors that have sadly left us. I am obviously speaking of the great David Carradine and Dennis Hopper. Both of which gave dynamite performances in roles that were written so beautifully, almost any one could have done them. But when you have legends like Carradine and Hopper involved, you are going go get brilliance. There are few guarantees in life, but exceptional performances form the likes of these cats is one you could always count on. And while we are speaking of legends, one that is still with us and was wonderful in this film is definitely the great Michael Madsen, who is always phenomenal. In fact, I would say Madsen gave one of his best performances of all time, aligned with his work on Kill Bill Vol. 2 and Donnie Brasco. And I will be damned if this isn’t just an amazing film to look at. It is a brilliantly written and directed film obviously, because Larry Bishop is genius to say the least. But it would be absolutely senseless not to note that cinematographer Scott Kevan did an absolutely brilliant job! Seriously folks, there is absolutely nothing to hate about this film. Critics tended to be assholes about the film with some serious biased assumptions and unfair judgements. But, this is a film you are either going to enjoy a great amount, or you just aren’t going to understand or care about. Which is fine. Different art forms appeal to different people. 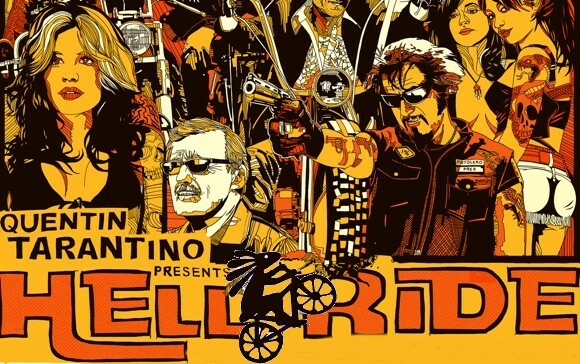 I’m just saying that if Hell Ride is a film that appeals to you, you are a person who would probably appeal to me. Because it is an all around wonderful film with a lovely cast and beautiful premise that the world should enjoy. Even if your just looking for a bit of nostalgia in your life, you are going to absolutely adore this brilliant piece of cinema!